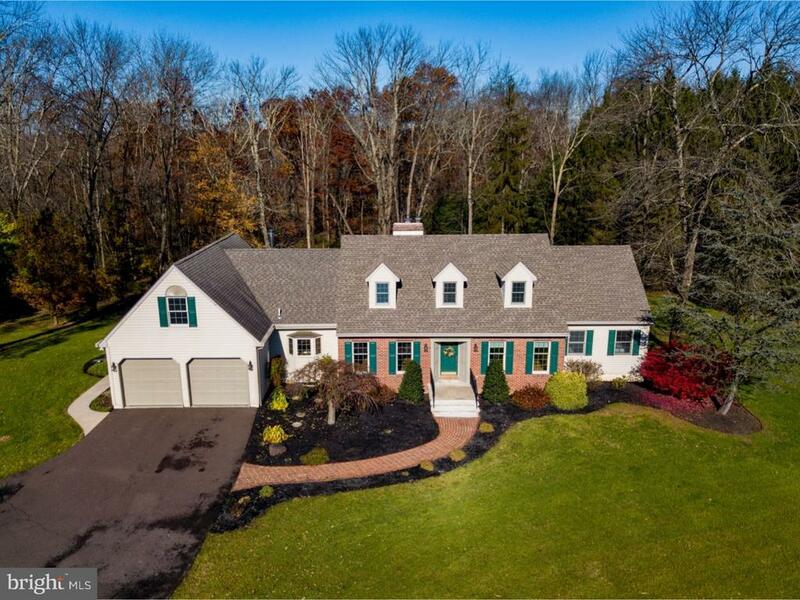 All seasons will be memorable in this expansive custom built brick colonial.Located in Central Bucks School District on 1.56 acres, this property offers unhampered views of the distant hillside. This home boasts over 3500 sq ft of quality living space. Start with the open tiled foyer that opens up to the formal living room w/hardwood floors and natural light as well as to the formal dining room again w/hardwood floors and large windows.There is custom woodwork and attention to detail throughout the home. The large kitchen offers custom cherry cabinets, new stainless appliances and a large deep set window for the great views abound. There is a large breakfast room that leads to a great enclosed, heated/air conditioned sun room with all around windows for your nature interaction. A spacious inviting family room with a brick wood burning fireplace and large open windows allow for an open floor plan to the kitchen and breakfast room area.There is an over sized laundry room and full bath both with custom cherry cabinets.At the other end of this floor lies a personal office with beautiful built in bookcases, a master suite with w/walk in closet and full bath. Upstairs, there are three other large bedrooms along with a bonus room and craft room . There is a large walk in attic area that could be converted to even more living space if needed! The full basement is open, dry and clean with a double door walkout, just waiting for your imagination. All of the smoke detectors are hard wired for your convenience. A two car attached garage completes this incredible package! Dont wait make your appointment today.